Il Campanello - Delightful village house with stupendous view! Quiet location. 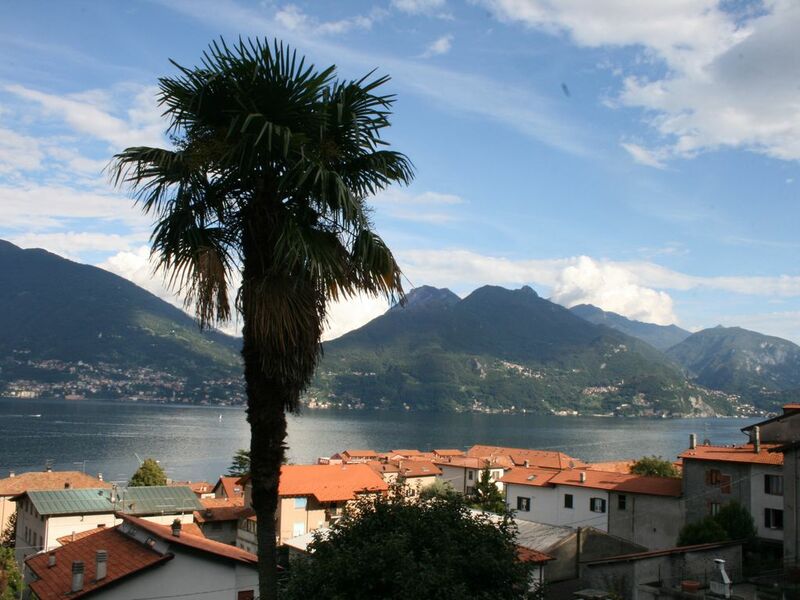 This charming village house, 300 years old and steeped in history, has been fully renovated by the present owners to provide modern comfortable accommodation with stunning views of Lake Como and the surrounding mountains. For families, groups or couples, this house has a special quality. Just stand by the window and let your heart soar. The house is set back from the main road on a cobbled lane. A vaulted corridor leads to an ample terrace for dining and lounging. Up stone stairs is the light and modern living and kitchen space with double windows onto the lake. The main bedroom (also with lake view) and bathrooms are on this level. Upstairs a spacious attic bedroom has views of the ancient village and the forest. Flatscreen TV with UK satellite channels. The upstairs room (twin beds) is equipped with games and a DVD player to entertain children. We can hire cot and high chair for you if needed, and water and energy costs are included in your rental. Although the building is centuries old, the decor is light and contemporary, with cosy details, like the wood-burning stove (wood provided), to make the house welcoming all year round. The thick stone walls mean it is never too hot in summer nor too cold in winter. Parking in a secure double garage is about 100m away at the end of the narrow cobbled street. But a car is not essential! Acquaseria, part of San Siro, is the perfect base for your holiday, with a wonderful family beach and probably the best pizzas on Lake Como. Il Campanello was once part of a convent on the Antica Via Regina, so it has a long tradition of welcoming travellers to the lake area, and we are happy to continue! We provided lots of information and maps to help you make the most of every day. But if you don't feel like going far, this is the perfect place, because the lovely beach, perfect for swimming and sunbathing, is only five minutes down a cobbled path, and the village has everything you need. When we first entered the house and opened the shutters, we fell in love with the view straight away, but it didn't take us long to love the village too. It has everything for a lovely holiday, whether you are a couple, a group of friends, or a family. We believe that on holiday you should be as comfortable as you would be at home, so we have put a lot of thought into the furnishings and equipment in the house. If you do like to cater for yourselves, you will find everything you need in the well-designed kitchen area. And if you are interested in sampling the local restaurants, there is plenty to attract you, with reputedly the best pizzas on the lake at Crème Caramel, down on the lakeside, and great food to at Da Luigi. There are three bars in the village, and good shops, including grocers, butchers and greengrocers. There is even a little market garden where you can buy fresh produce straight out of the ground. As you walk around the village you start to see the variety of life here. It is a fascinating mix of village, tourism and rural. The ancient pilgrim path, the Antica Via Regina, passes through the village below the house, and strolling down it to the cashpoint, you pass fine villas, lovely gardens, and even a farmhouse with chickens, goats and cows in the yard. Acquaseria is perfectly situated for exploring the famous tourist attractions around the central lake area, such as Menaggio, Varenna, Bellagio and the Villa Carlotta, which is only 7 minutes away. There is unlimited scope for hiking and water sports, but if you just want to relax, why not stretch out on the beach? Or just collapse on the lounger on the terrace. For children, we provide a range of toys, movies and games, and plenty of books and DVDs for the grown-ups too. Il Campanello (the little bell) is so named because it is the only house in the village that still has its old-fashioned brass doorbell, that works with a chain by the front door that you pull. As you go in, there is heaps of period character in the vaulted entrance corridor that leads to the terrace. Taking the stairs to the first floor you enter a very different space, contemporary and open, with that stunning view. The bathrooms are bright and modern, and both bedrooms are spacious with tons of hanging space for your holiday gear. It's the perfect blend of period charm and modern convenience. Each bathroom is equipped with shower unit, toilet, bidet and washbasin. One bathroom also houses the washing machine. Modern gas central heating. Just turn the thermostat in the living room to the required temperature and the boiler will do the rest. It may take a few minutes for the heat to reach the radiators. Bedlinen and teatowels are provided. Small washing machine in the bathroom. Airers downstairs for use on the terrace or in the corridor. Secure garage parking is a couple of minutes' walk from the house. We share a double garage with another family. Please make sure you leave enough space for a second car to come in and out. Mobile wifi modem is provided. This will provide a good enough service for web-browsing, email and calls over wireless. However, please respect our limit and don't try to stream large files. Hand towel and bath towel per person. Please bring your own beach towel. Wood is provided in the woodpile in the entrance. For kindling,we usually go down to the beach and collect dry wood there. You can buy matches from the bar, and firelighters from the grocery store. Large sofa and rocking chair. There is a light wicker chair in the attic bedroom that can be carried downstairs for use in the living room if required. Induction hob provides speed and safety. We have a combination oven which has grill, microwave and conventional oven cooking. You will find some staples in the store cupboard when you arrive. Loads of these! Kitchen utensils are in the drawer under the worktop. Table cutlery is in the drawer of the dining table. Large farmhouse-style table. There is a drawer in the dining table where you will find the table cutlery. UK satellite channels available (freeview). We have a portable dvd player and play through the TV speakers. Board games, cards, some beach playthings available. You'll find CDs in a blue box upstairs. Games and jigsaw puzzles. There is a jigsaw mat on top of the wardrobe in the upstairs bedroom if you would like to use it. Selection of DVDs for adults and children. Available in the garage if required, by arrangement. At your own risk! Because of the stairs from the entrance to the living area, we regret that this property is not suitable for wheelchair users. It is the view that captivates guests, but we have provided everything you need to feel right at home. We want you to be comfortable and relaxed, so please let us know if you have any special requirements or questions. Unbeatable views from exceptional accommodation. This is our second stay at Il Campanello and it remains one of our favorite destinations. This 2 bedroom, unique historic townhouse is extremely comfortable with all mod cons and the most amazing views over Lake Como to the mountains. It's just a short walk to the lake front, village shops, restaurants and the local bus to travel around the lake. The house is set up to be a home from home, comfortable beds, washing machine, English speaking tv channels, books to read and free wifi, in fact everything for a comfortable, relaxing holiday. Thanks for the lovely review! It's great to know that people feel comfortable and relaxed at the house, in winter as well as summer. Wow, what a place! As soon as we arrived, it was clear we had made a great choice. The views from the house are truly stunning. I think you would be hard pushed to find a better outlook anywhere. The house was perfect for our needs, meeting all of our requirements. Location was great, in a residential area in a wonderfully historic part of town, adding to the overall experience. Lake/beach is a five minute walk away, and perfect for swimming and relaxing. It was so quiet and peaceful. The village has all the amenities you might need, so no need to find a supermarket; with most things available within a five minute walk from small and friendly local shops. Great local restaurants too, serving good quality, reasonably priced food. Village is also a great base for some stunning walks, and access to the rest of Lake Como via the local bus service, which takes seven minutes to get to Menaggio, although we preferred to walk, which takes about an hour. So to conclude, we all loved Il Campanello, which is indeed delightful. A wonderful holiday had by all, so thank you for allowing us to stay in your house! Wonderful! We are so glad you had a great holiday, and thanks for the fab review! There is a large gap between loved it and not really and we fall somewhere in the middle! The house was beautiful and obviously a labour of love by the owners. It was excellently appointed and spotlessly clean and we felt instantly at home. Dealing with the owner Kate was such an easy thing to do and her taking the time to make us dinner reservations for our first night was so appreciated. To say the view is breathtaking is an understatement. The location on Lake Como is perfect for taking ferries to other charming towns as well as the nearness to Lugano Switzerland and Como itself. Lots to see and do with the Crème Caramel and Luigi restaurants being a gourmet delight with a to die for staff - Naomi at Crème and Mattea at Luigi's. Loved the effort to speak to us in English along with the smiles when we mangled Italian! Unfortunately we were in a construction zone for six of our seven day visit coupled with the constant dog barking made life difficult when we were in the house. This having been said we have wonderful memories of the Lake Como area. We are very glad that you liked the house. What a pity that you experienced some disturbance from temporary renovation work taking place in a neighbouring house. We are right in the historical heart of the village so this kind of thing, while it can happen, is out of our control. We are very keen that everyone should have a really good experience at Il Campanello. We will have a word with the neighbours to try to minimise disruption. The house had everything we needed in terms of cooking utensils, washing machine and other items. We also appreciated the access to English programmes so we could catch up on news and watch the occasional programme. It also offered wonderful views of Lake Como. We did have a little difficulty finding the property but were able to contact the owner who provided additional advice. The property is probably not well-suited to those who have asthma or lung disease as there is a short walk up inclines and small steps involved, and carting luggage was challenging! A garage is available but we couldn't fit our family-sized vehicle in it so used the car park nearby, which was fine. The village of Acquaseria is small and quiet, but has a couple of places at which you can dine. We enjoyed dinner one night at Luigi's. Thanks for this review and the helpful feedback. We haven't had reports before of difficulty with the garage so we will clarify on our information that it is suitable for cars 4m long. We do advise guests that a trolley is available for luggage. Glad you enjoyed your stay! We had a wonderful 10 days stay in this charming house. Exciting walk from the car park down alleys between the ancient houses to find Il Campanello. The interior did not disappoint - photos show the rooms off well, but once the shutters and windows were open it was hard to take your eyes from the stunning views. House cooled down well and offered welcome respite from the heat of the August sun. Lots of walking. Lovely local villages and Menaggio just down the coast for a few shops and cafes/bars. Lazy day taking the ferries to various lake side towns (day ticket). Lazier days just on the local pebble beach dipping in and out of the lake. Didn't take long to realise that the village shops have everything we needed and two good pizza places which left the kids wide eyed (but they managed to eat the lot!) the village has clearly been chosen well - just the right size for some shops and places to eat, but not so big to feel very tourist-ridden. Would have liked to have climbed to the top of some of the mountains we enjoyed looking at, but 9 and 12 year old weren't having that - we'll have to come back for that! Could probably have managed without a car with a bit of planning from airport. Local bus service was good which we took to visit Villa Carlotta for stress free trip down side of lake. Multiple ferry services also good from Menaggio, reached via a flat 1 hour walk, or spectacular climbing 2 hour walk, or by bus, or car. Kate's tips on the website and the various suggestions in the visitor book are really helpful. A lovely stress free holiday - would certainly recommend and would love to return. Thanks for this super review!